The PEP software provides the management team with what they need and has the flexibility to respond to ongoing operational changes. As shown in the graphic, in PEP the production data is seamlessly integrated with the Time & Attendance System (T&A) for effective labor management. Without this integration, you can never be sure that all the paid hours are included in the program. PEP is also capable of accepting files from various Warehouse Management Systems (WMS), Warehouse Control Systems (WCS), and various Legacy Systems. Using these files reduces clerical effort and improves data accuracy. PEP is easy to install and the software maintenance is the responsibility of Cook & Associates. This feature greatly minimizes the need for IT support. New releases are free and simple to install; normally less than 5 minutes per computer. Data security is paramount and PEP achieves this security by automatically backing up and archiving all data files. Hardware requirements are kept to a minimum; usually one or two dedicated computers and a minimum amount of network storage to permit access to the various PEP reports. The report availability is customized through our innovative Report Manager feature that assures employees, managers, and executives get the right reports at the right time. However, the most important feature in any Labor Management Software is that it contains a wide variety of user-defined options. In PEP, users have the ability to customize their Labor Management Program without having to customize the software. In our Labor Management Projects, the PEP software not only includes work measurement, but all the other necessary modules. Since PEP is a stand-alone program, there is no need to implement new Warehouse Management Programs, Time & Attendance systems, etc. Above all, the Cook & Associates team doing the implementation has the qualifications and track record in all of the key disciplines. Don't be misled by the low cost quoted for a Labor Management module that is part of a large suite of other software systems. The real implementation effort is not involved with the installation of software. Although the Labor Management Software is very important, it should be less than 5% of the Program implementation time and costs. Implementing a Labor Management Program goes far beyond the installation of software. There are many facets to a successful program, including significant training of managers and staff to make the program work. The software installation actually requires very little in-house IT assistance and can be accomplished in a short period of time — in PEP, about 2 hours. 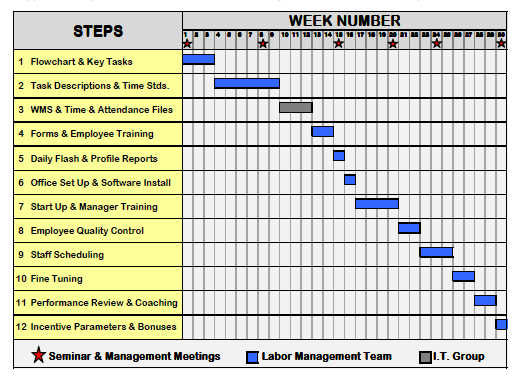 IMPLEMENTATION TIME: The sample PEP Project Workplan shows a typical implementation with 12 steps over a 30-week period. Steps 1 & 2: Flow charting and time standards. This part of the project can be expanded to include methods improvement recommendations and the standardization of the various processing functions. Steps 3 & 4: Data collection methods. Step 5: Daily Flash and Weekly Profile reports. Step 6: Software installation and support training. Step 7: Program comes on-line. Extensive management training. 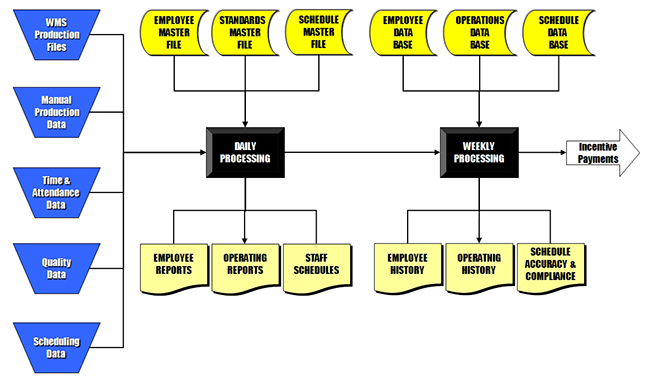 Steps 8 & 9: Employee Quality Control and Staff Scheduling modules. Step 10: Fine-tuning the overall Program. Steps 11 & 12: Employee Performance Review and, if desired, incentive parameters and simulated payments. The stars represent Management Meetings and a PEP Seminar that is held prior to starting the implementation. This seminar is important to get everyone on board and to have them understand their responsibilities. It also includes role-playing and addresses any potential issues that might arise. The interim meetings assure that everyone is kept abreast of the progress and encourage manager and employee feedback. IMPLEMENTATION COSTS: Cook & Associates Project costs are based on each specific assignment; normally they will range between $150,000 and $250,000 for a single facility. To guarantee the total project cost, all assignments are quoted on a fixed-cost basis. This covers the entire implementation including extensive training, setting standards, etc. In other words, at project completion, the client has an up and running Labor Management Program. OPERATING COSTS: These costs are comprised of clerical processing, software license and support, and program coordination (usually an in-house Industrial Engineer). Normally the total weekly operating costs will range between $700 and $1,400 for a single facility. This should amount to less than 2% of the facility's annual labor cost. In some cases, Labor Management takes a back seat to other operating changes and capital expenditures. Dynamic companies should be continuously involved with operating changes for productivity improvement, but these changes should not hold up a Labor Management Project. Actually, the Labor Management Program should provide the information needed to identify areas where methods improvements are required and then be able to monitor the effectiveness of the changes. Labor Management Programs often have to compete for capital with more glamorous physical changes. It's easier to see changes in a modernized facility, exciting sortation equipment, and sophisticated systems. If they are justified with a sound return on investment, all these physical improvements certainly should be pursued. But perhaps, the rate of return should be compared to that of an effective Labor Management Program.